Let’s say that you’re an owner of an online business and you want to get your customers’ opinion about the new menu on your website that you’ve just implemented. You know that happy customers are an essential component of any profitable company, so you’ve created an online survey. But how do you get this feedback? If you were a brick and mortar store, you could include the title of the survey on the sales receipt as well as a link to it to help customers find it online. To increase the chance that more people take the survey, you could also ask them personally. However, even despite your best effort to convince customers to participate, they make the final decision, and it depends on a lot of factors. For example, survey purpose, design, optimization for mobile devices, the popularity of your brand, and many more other factors are known to impact survey response rates. Even for online businesses, they make collecting feedback really challenging. That’s why customer survey response rates often fall below 20 percent, which is still reasonable but could be improved. One way to improve it is to use Quick Response (QR) codes. Many companies have discovered that they can be a valuable tool for communicating information to customers and making it easy to respond to such requests as survey participation. If you follow the best practices described in this article, you can reach more customers by using QR codes and get that much-needed feedback to improve your business. What is QR Code? How does it Work? Chances are that you’ve seen a lot of QR codes – small, black and white 2D codes that businesses include on everything from sales receipts to products. They are a very convenient way to direct people to a website to get information without having to provide all of it right away, so their adoption by brands has increased dramatically in recent years. In fact, they are still holding strong and being used by an increasing number of brands. 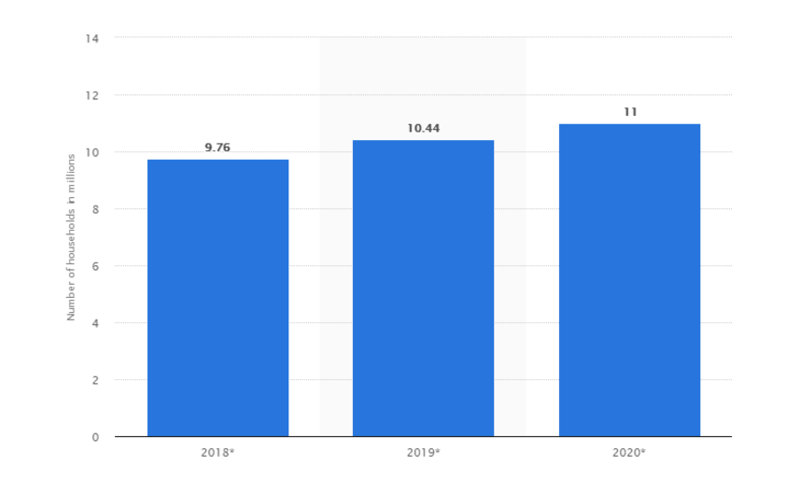 For example, according to Statista, the number of U.S. Internet households with users who scanned QR code on their smartphones so far in 2018 is 9.7 million, and should increase to 11 million in 2020. Such massive popularity of QR codes among businesses has been explained by several reasons. One of them is an extreme mobile device adoption; for example, Pew Research Center’s data showed that the vast majority of Americans – 95 percent – own a cell phone of some kind. Many customers use them to browse the net and search for products and services, so QR codes are a really convenient way to access surveys and other online resources. In other words, being mobile-friendly is a must to get maximum information, and create happy customers. The next reason is the ease of use of QR codes. To read a code and land on a survey’s page, a smartphone user just needs to scan it. The page will open in the browser in a few seconds (in many cases, permission to go to the webpage may be required). In many cases, no additional software is required, too; for example, Google and Apple included QR code readers in its mobile operating systems, Android and iOS. Another major reason for the popularity of QR codes is that businesses can easily create them. For example, if you need to generate a unique code to make it easier for your customers to participate in an online survey, you can use free online tools such as QR Code Generator and QR Code Monkey. All you need to do is enter the URL of the survey’s page and click on the “Generate” button. Now that we know quite a bit about QR codes, let’s learn how to use them to increase survey response rates and get more valuable information for improving your services and create more happy customers. Many marketers say this is the most important rule for maximizing the effectiveness of QR codes, and it makes a perfect sense. People who scan the code should know why they should do and what happens when they do. One cannot tell the purpose of a QR code just by looking at it. Given that the purposes for the codes are numerous, having customers guess the intent of your code is a really bad idea. If they don’t know what will happen when they scan the code, they won’t do it. So, make it very clear why you’re using a QR code and concisely explain what will appear on the screen of a customer’s device when they scan it. A great example of a brand doing this right is Taco Bell. In 2013, they launched the ESPN College Football campaign for the Bowl Championship Series in partnership with ESPN and included QR codes on variety 12 pack taco boxes and soda cups. As you can see in the image below, calls to actions employed by Taco Bell in this campaign were “Scan the Code – Score ESPN Videos” on the back of the cup and “Scan It For Exclusive ESPN Videos!” above the actual code. A well-known food processing brand Heinz took it one step further and launched the Wounded Warrior Project campaign. 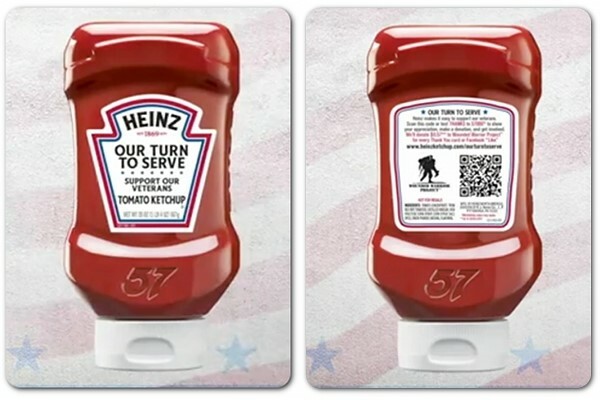 The purpose of this project was to help injured American veterans; for each scan of the QR code on Heinz ketchup bottles, the company donated money to Wounded Warrior Project, a non-profit organization that helps veterans. Imagine the situation: a Taco Bell customer who is also a football fan buys a cup of coda and scans the code with their smartphone. Inspired by the advertising, the customer thinks that they’re about to get access to exclusive football videos. But what happens is they get redirected to a website that is not optimized for viewing on small screens. As the result, using that website on a smartphone is one horrible experience. The customer abandons it almost immediately. The campaign didn’t achieve its goal even though it had an awesome idea and great advertising. To make sure that all customers landing on the survey website are happy customers, your website has to have a responsive, mobile-friendly design. QR codes are a purely mobile experience so the content they link to should also be optimized for mobile users. Most online survey platforms have a responsive design, but if you’re using your website, feel free to check whether it meets this requirement with Google’s free Mobile-Friendly Test. While this one seems like a no-brainer, you wouldn’t believe the places where businesses put QR codes. 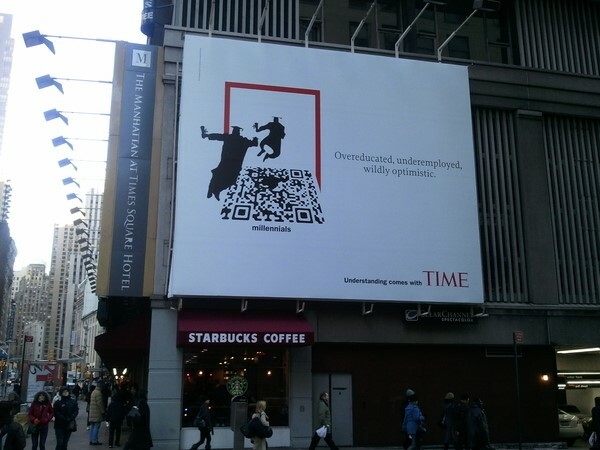 For example, this compilation of some of the most ridiculous placements of QR codes from Econsultancy lists some of them. How about this one from Time? Obviously, no one is tall enough to reach this banner to scan the code. In fact, the banner is so high that no one can do it without a crane. The person who took this picture had to zoom in on this computer at home to scan it. Would you bother to do the same? Of course not. When you check out the rest of the ridiculous placements, you’ll realize that this tip is indeed important. People aren’t going to scan your QR code unless it’s easily accessible to them, so place it where they can see it can scan without having to take photos and zoom in on a computer. The more information there is in a QR code, the smaller its dots are. The size of dots is an important factor when it comes to scanning because the bigger they are, the easier it is for the device to read it. If your customer fails to scan your code multiple times because of its small size, chances are they won’t bother to do it again. After all, no matter how great your survey may sound, trying to scan a code for 10 minutes is ridiculous. Of course, they won’t go to company review sites to write a bad review about their customer experience, but they’ll certainly remember that a business cannot deliver such a simple thing. If you’re looking for a good URL shortener to maximize the dots on your QR codes, feel free to use Google URL Shortener and Tiny URL, they’re free and do the job well. To get as much data as you can and use it to ensure that your business has more happy customers, you should share your QR codes creatively, too. Check out the following ideas on QR code placement that might help you reach more survey takers. Print materials. Product catalogs, packaging, posters, receipts, menus, and other print materials that you distribute to your customers should have your QR codes to help you get more information from them. Your store. For example, if you’re running a coffee shop, why not put a poster with a QR code linking to a customer satisfaction survey near the counter or the coffee machine? Happy customers tend to be return customers, so continuing to improve your products and services is an essential requirement. To get the information needed to ensure a continuous improvement and focus on customers’ needs, you need to collect their feedback. QR codes could help you to get more participants for your customer surveys. 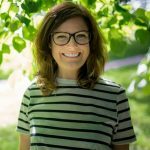 Start placing them where you can and don’t forget about the practices and tips described in this article to ensure that everyone who scans it has no problem accessing and taking the survey.